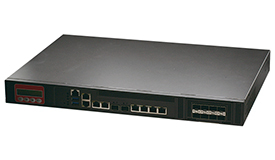 AAEON’s FWS-7360 1U network appliance is a 10Gb Fiber solution for faster connection speeds. Powered by the Intel® Atom™ Processor C3000 Series (formerly Denverton), it offers QAT, Intel’s latest security and compression technology. This user friendly device is the perfect system for wireless gateway, SD-WAN, IPS, WAN Optimization, NFV and vCPE applications as it can be expanded to offer WiFi and 4G LTE, and it’s fitted with a range of mass storage connections.